After a couple decades of life enjoying Bloody Marys and sampling different brands of ‘the world’s most variable drink’, we got to thinking. 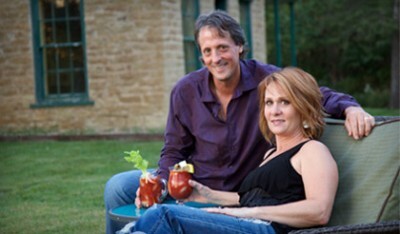 It was time to get serious about our passion for the perfect Bloody Mary and satisfy our entrepreneurial spirits at the same time. Time to research and develop a knock-out recipe with the flavor to please the wide-ranging palettes of Bloody Mary aficionados. Like you, we have tasted our share of too watery, too bland, too thin or too thick, too-tomato-ey, too ‘make–up-your-own-adjective’ Bloody Mary Mixes. Our goal was to find the perfect blend of ingredients matched with the perfect consistency. Sure, our Side Show secret recipes utilize some typical bloody mary ingredients, but several surprises as well. After experimenting with and testing over 75 different recipes, we found our winning formulas. The secret is in the blend of over 13 ingredients, used in each of three varieties—from Strongman to Fire Breather. There is a flavor for every taste. So go ahead and seize your Side Show! And always drink authentically. The nickname ‘Bloody Mary’ was given to Queen Mary Tudor of England, due to the number of protestant tudors executed during her reign. “I love bright red drinks, don’t you? They taste twice as good as any other color.”—L.M. Montogomery, Anne of Green Gables. When in Canada, if what you want is a Bloody Mary, ask for a ‘Bloody Caesar’ just a ‘Caesar.’ Those Canucks keep us on our toes! In 1942 and for a time after, Life Magazine referred to the Bloody Mary as the ‘Red Snapper,’ some say because the former name was a bit too racy for the era. “Max Davidson of The Daily Telegraph called the Bloody Mary “the world’s most complex cocktail,” in 2013.